A “spicy iris modern chypre” that “exquisitely mirrors Duke Ellington's unforgettable masterpiece”? I adore iris, chypres, and Duke Ellington. Sign me up! At least, this is what I thought when I read the launch announcement about Ys Uzac Satin Doll in July. Satin Doll’s PR copy included another teaser, saying that the iris was “embraced by a bitter and dry tuberose.” I adore tuberose, too, but often it doesn’t sit right on me. Maybe a bitter and dry tuberose would be just the ticket. The rest of Satin Doll’s notes are entrancing, too. Besides iris and tuberose, they include pink pepper, elemi, pepper, rose, jasmine, myrrh, incense, patchouli, opoponax, and benzoin. Really, doesn’t this perfume sound perfect? Sadly for me, although Satin Doll is nice, it doesn’t communicate the beauty, swing, and freakiness of Ellington’s song.1 Instead, the fragrance hints at all of these elements but is overwhelmed by what comes off as sharp, peppery wood. Let’s go through Satin Doll’s major elements. First, the iris. Satin Doll’s iris is subtle and rich, but not insistent. The iris blends with the rest of the fragrance’s floral heart for an off-dry, pretty scent. I’m sure the tuberose is in there somewhere, and rose wets it a bit. But if you’re an iris fan and want a big whiff of it, try something else. Next, Satin Doll’s “modern chypre” aspect. Satin Doll does dare to shine a bit of chypre allure, even though it’s cleaned up. After about an hour of wear, as the florals melt away, a hint of the fustiness I get from oakmoss emerges, but it’s cleaner — almost soapy — and not as fuzzy and earthy as oakmoss. A grand chypre can be ugly and spellbindingly gorgeous at the same time, sort of like Maria Callas. Satin Doll is more like Keira Knightley with a mole. Finally, the “spicy.” Satin Doll packs a lot of pepper and what smells like fresh wood shavings, and not sweet sandalwood shavings, either. To me, they overwhelm the rest of the fragrance from the get-go, and they march on right through to Satin Doll’s end about five or six hours later. Along the way, they pick up a hint of soapiness. 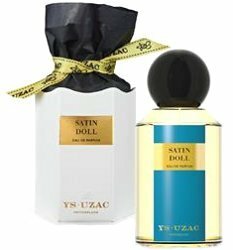 Ys Uzac Satin Doll is available in 100 ml Eau de Parfum Haute Concentration for $230. For information on where to buy it, see Ys Uzac under Perfume Houses. 1. Satin Doll, written by Duke Ellington and Billy Strayhorn in 1953, was at first an instrumental. (You can see the Duke himself play it with his orchestra here.) Johnny Mercer wrote its fabulously weird lyrics a while later. For a sample, here’s the song’s opener: “Cigarette holder which wigs me, Over her shoulder, she digs me.” It's worth looking up the rest. If you knew nothing about this before trying it, do you think you’d have felt differently? And “Keira Knightly with a mole”….loved that! Good question! I probably would have–I’m such a sucker for advertising copy that I was sure I’d love this one. If I hadn’t known anything, I probably would have pegged it as a woody floral, not my favorite type of fragrance (not one I *don’t* like, but just not one I seek out). I like woody florals, don’t mind cleaned-up moss and don’t pine for earthy iris. Count me “still interested.” If I can find a sample somewhere, I’m going to try. I’d love to know what you think of it! Luckyscent has samples, I believe. Looka here now, if you’re gonna be naming your perfume after a classic by Himself, you need to be bringing your A Game. And I’m not sure why they’d put wood in anything named Satin. Or tuberose, for that matter. Maybe you could get away with a little gardenia, but this needed to be cool and smooth…. they were off to a fantastic start with chypre/iris twist, but it seems like it ultimately got chaotic. So, you’re good with Satin Doll Eau Fraiche? I’d give it a square try! Too bad. So many perfumes ruined by woody notes these days, in the absence of the old, now banned base notes. I do love Ys Uzac Pohadka – one of my favorite late spring/early summer perfumes. It will soon be time for it again, no matter how hard the polar vortex tries to keep us in winter. I’ve found the same thing about woody notes–sometimes supplemented with some musk–these days. And I agree about Pohadka!